As doubleheader cards teeing up the expected winners to face one another go, Saturday night was a disaster. As gobsmacking, can’t-believe-your-eyes upsets go, well, one out of two ain’t bad. 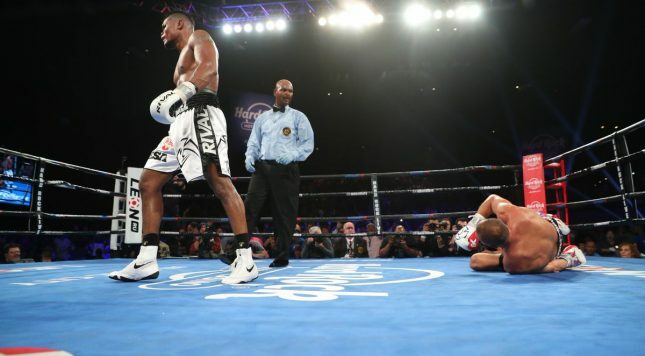 Long-languishing light heavyweight Eleider Alvarez, put in the ring on HBO as an authentic test for longtime boogeyman Sergey “Krusher” Kovalev, notched the upset with a violent three-knockdown 7th round that demolished the power-punching bully. The undercard was far less interesting, as would-be Kovalev opponent Dmitry Bivol had to deal with Living Piece Of Gum Stuck In Your Teeth Isaac Chilemba en route to a clear decision win that didn’t glamorize anyone. But man, Alvarez! Didja see? Didja? He started in a way that suggested trouble for Kovalev, firing body punches the way the first man to truly vanquish Kovalev — Andre Ward — did. His solid boxing fundamentals surely had Kovalev thinking he was haunted by Ward’s poltergeist. But Kovalev collected himself and started throwing mean punches, seemingly taking over in the middle rounds with volume. At one point Alvarez tried to trade, and all he got out of it was bloodied. So it was more than a little surprising in multiple dimensions — that the not-too-powerful Alvarez scored a knockdown, that the usually sturdy Kovalev was on the ground at all, and that Kovalev looked so rattled it was immediately doubtful if he’d make it out of the round — when Alvarez landed a huge overhead right that melted Kovalev’s jowls. And yeah, that’s where it went. Two more left-right combos ended Kovalev’s night, as he wasn’t capable of or willing to tie up or move around or otherwise buy time to gather the wits he left spilled all over the ring. This was a dangerous matchmaking decision, albeit a worthy one for viewers. It promised to answer the questions about whether the Kovalev in against relatively easy foes since his losses to Ward, against opponents who wouldn’t pose similar troubles Ward did, was for real. The answer strongly appears to be, “No.” You have to guess Main Events, Kovalev’s promoters, knew Kovalev might be a bit of an illusion at age 35, and was hoping he’d overcome this highly credible test en route to a potential last big cash fight against Bivol, win or lose. Still, Kovalev at least behaved like a real fighter by taking on Alvarez, since the light heavyweight champion, Adonis Stevenson, has behaved like anything but. After all, Alvarez was amid a 13-month layoff because Stevenson hasn’t faced him despite being Alvarez his mandatory challenger for some sanctioning organization or another — starting back in 2015 (!) — a reminder that, when convenient for the wallets of the powerful, nobody is really forced to do anything by these fraudulent outfits. This writer didn’t catch the whole Bivol-Chilemba fight, but that matchmaking was worse, despite being defensible on a competitive level, because there was no way a spoiler like Chilemba was going to build any interest in Bivol’s next fight, especially because Bivol is a conservative technician first who scores knockouts second. If Chilemba wasn’t going to be willing, and when is he?, Bivol wasn’t going to get to show off much. Nonetheless, promotional turf wars (ah, it’s so nice we never have to worry about THOSE) might make Alvarez-Bivol about as good as it gets for either man. In that sense, along with the others, this card was all over the place. Some good, some bad, conceptually and actually, not ending as anyone intended but ending up in a pretty decent place anyhow.